Don't let your bill put a dent in your day. 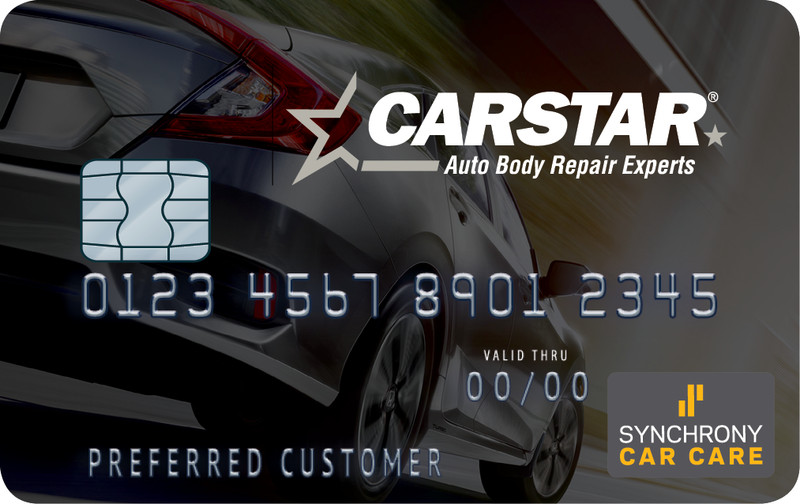 At CARSTAR, we offer a financing option with the CARSTAR Synchrony Car Care Credit Card designed to help get you back on the road with your budget in mind. Available at participating locations. On purchases made with your CARSTAR credit card. Interest will be charged to your account from the purchase date if the promotional purchase is not paid in full within the promotional period. Minimum monthly payments required. To access the application for the “CARSTAR Synchrony Car Care Credit Card” you will be redirected to a third-party site that CARSTAR Franchising, Inc. does not own, operate, or control. If you have questions or concerns about accessing the application for the “CARSTAR Synchrony Car Care Credit Card,” please contact us at http://www.drivenbrands.com/accessibility/contact-form/. For more information about our accessibility efforts, please visit our Website Accessibility page at https://www.carstar.com/web-accessibility/. **Gas purchases not eligible for promotional financing. Subject to credit approval. Valid everywhere Synchrony Car Care is accepted in the U.S. & P.R. Visit mysynchrony.com/carcare to find a gas station near you. See your local CARSTAR for details. ***Purchase APR is 29.99%; Minimum Interest Charge is $2. Existing cardholders should see their credit card agreement for their applicable terms. Subject to credit approval.